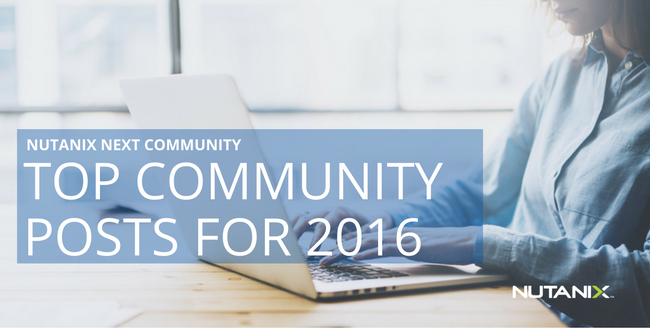 I hope you enjoyed the material we published on the Nutanix community blog in 2016. We work hard on writing material that will help inform, with our how-to articles, and educate with our videos from nu.school. If there is a topic you would like us to write about, lets us know if the comments below and we can make it happen. As 2016 draws to a close, here are the top seven most viewed posts from the past year on our community site starting with number seven. Steven Kaplan shares how Nutanix enables Cisco USC C-series customers to bring AWS-like simplicity and scalability to their own datacenters, but with lower cost and greater control. Mike McGhee explains how Nutanix VM mobility provides a simplified means for replicating Nutanix based virtual machines between different hypervisors. The release of Acropolis 4.7 brought many new features and also some tech preview items for folks to test out in their labs. Denis Guyadeen shares how Nutanix and Docker solutions provide two great advantages, the web-scale IT of Nutanix alongside the speed and agility of Docker. This is Steven Kaplan second spot on the list. It's in this post he defines steps, that Nutanix customers (including Dell XC and Lenovo HX) can take to help contain, and optimize, Oracle licensing on the Nutanix Enterprise Cloud Platform. This is part two of Richard Arsenian popular post on getting started with Nutanix community edition and the Intel NUC. In this post he outlines how he also gave the NUC a custom paint job. Richard Arsenian walks through installing Nutanix community edition on an Intel NUC for your home lab. It's a great read and interesting way to get familiar with community edition. Hope you enjoyed the list, continue the conversation in our community forums and share your experiences with the community. Also follow Nutanix on Twitter for the latest news and announcements. With each release the tool sets keep getting better. Thank you Nutanix! Thanks for sharing sturunen - links have been fixed!